Mr. 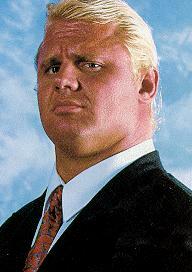 Perfect Curt Hennig began his career in the WWF in the late eighties and immediately made an impact. With terrific acting and microphone skills as well as above average atheletic ability, Mr. 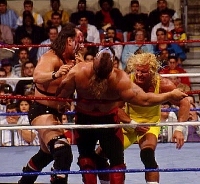 Perfect quickly made his way into the upper eschelon of the main event card as he reeled off victory after victory while undefeated in his early WWF career. Armed with his finishing move the Perfect Plex and his catch phrase "NOBODY beats Mr. Perfect. NOBODY!" Mr. Perfect went into WrestleMania 6 and his biggest fued ever, against Brutis 'The Barber' Beefcake, a match which he promptly lost. Interesting enough he continued to use the catch phrase even after the embarrasing defeat. With his perfect record now permanently marred, Mr. Perfect set his sights on regaining respect, and defeated Tino Santana in an 8-man tournament to claim the WWF Intercontinental Title which was vacated by the Ultimate Warrior. Perfect held the title for an astounding four months before dropping the title to The Texas Tornado. After a few months Mr. Perfect won a rematch with the Tornado, regaining the Intercontinental Belt. Hennig went on another long streak of victories while successfully defending the belt for nearly eight months, but was bested in 1991 by Bret 'The Hitman' Hart in one of the more memorable fueds of the era. Soon afterwards Hennig left the WWF because of a severe back injury. He has made several comebacks, but never achieved the main event status that many thought he was destined for. He is a native of the northern suburbs of Minneapolis and has been seen at the golf course where my friend works at. He drives an SUV and never tips anyone. In the early nineties his son was babysat by my friend's mother. Mr. Perfect is making has a one time deal for an appearance at the WWF Royal Rumble Sunday January 20th. This ensures that he will not win the match, but if the crowd reaction is good maybe it will lead to a longer contract. If it doesn't, in our hearts we will always have the memories of Mr. Perfect and his head snapping back totally out of sync as he was punched and jumping over the top rope 10 seconds after being clotheslined.